Department of Computer Science, Houghton College, Houghton, NY, USA. Received 29 October 2009; revised 6 November 2009; accepted 9 November 2009.
the other network across the two proteins HA and NA. pivotal role in viral infection and replication. the stem contains some residues of HA1 and all of HA2. viruses with this motif tend to have high virulence . 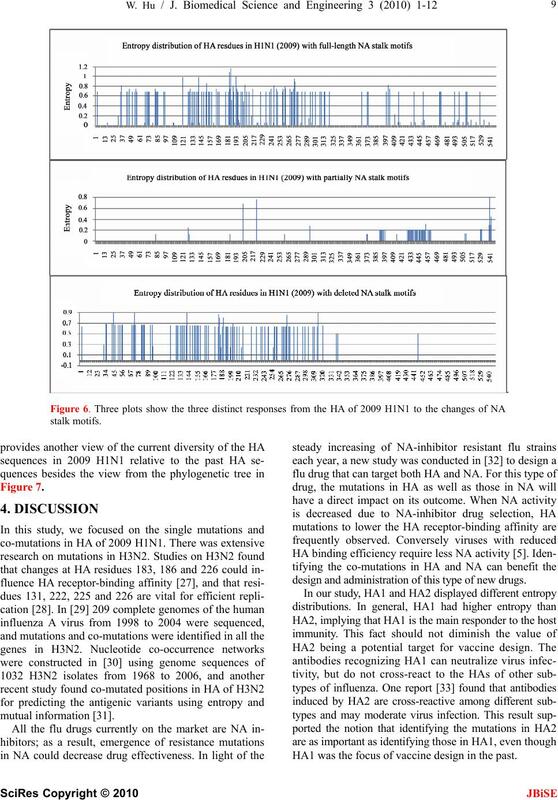 pact of the NA motifs on HA in the 2009 H1N1 strains. fect the active site from a greater distance. 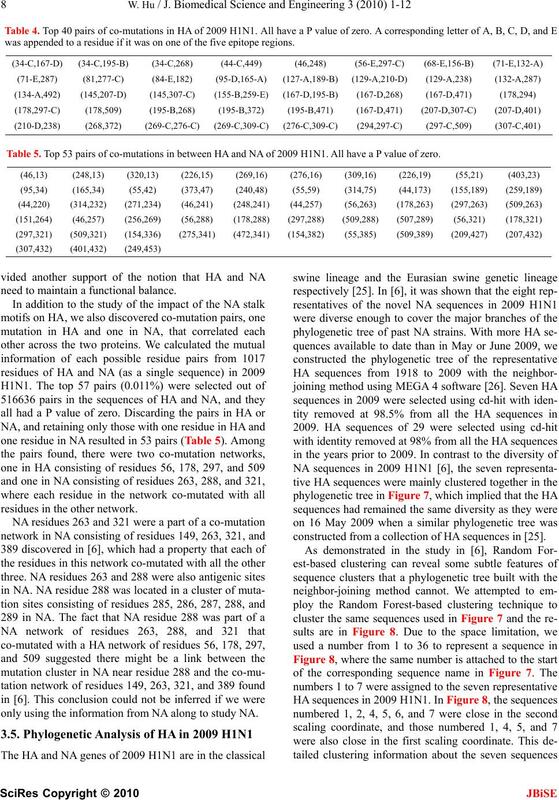 and co-mutations between HA and NA of 2009 H1N1. 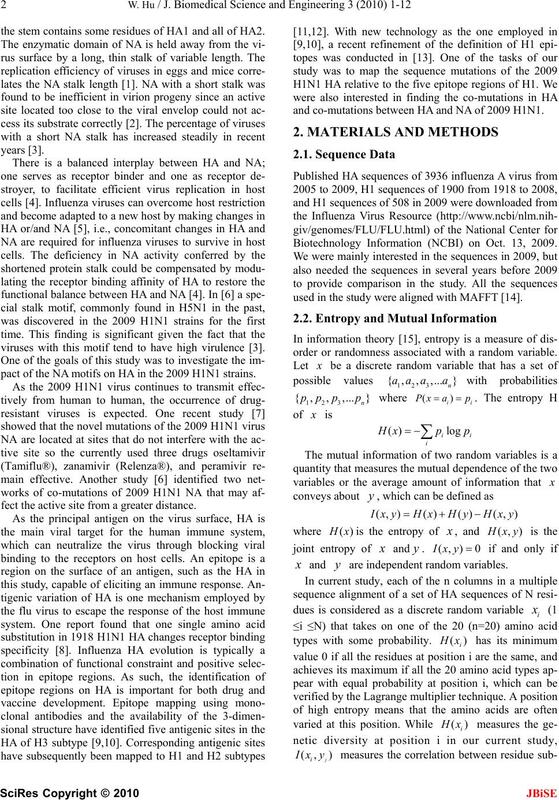 Biotechnology Information (NCBI) on Oct. 13, 2009.
used in the study were aligned with MAFFT . quences, can be found in . is an ensemble classifier based on many decision trees. this problem by averaging across different decision trees. beled data, leading to unsupervised clustering. Table 1. 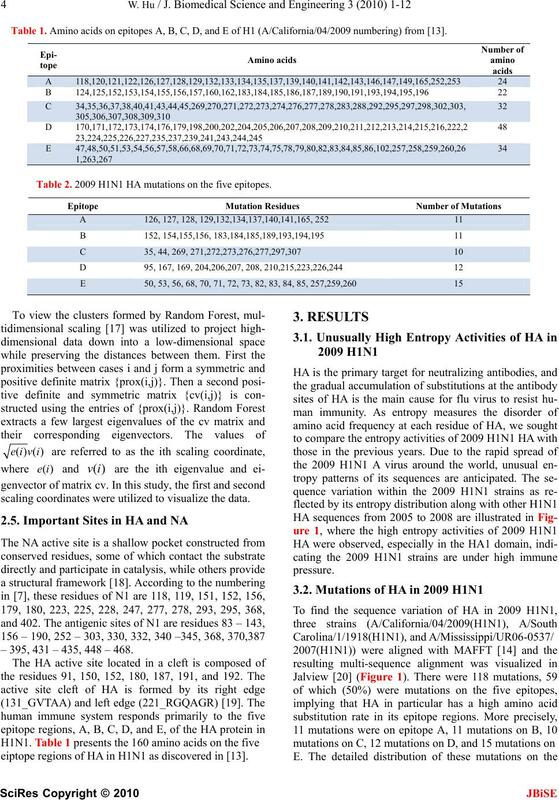 Amino acids on epitopes A, B, C, D, and E of H1 (A/California/04/2009 numbering) from . Table 2. 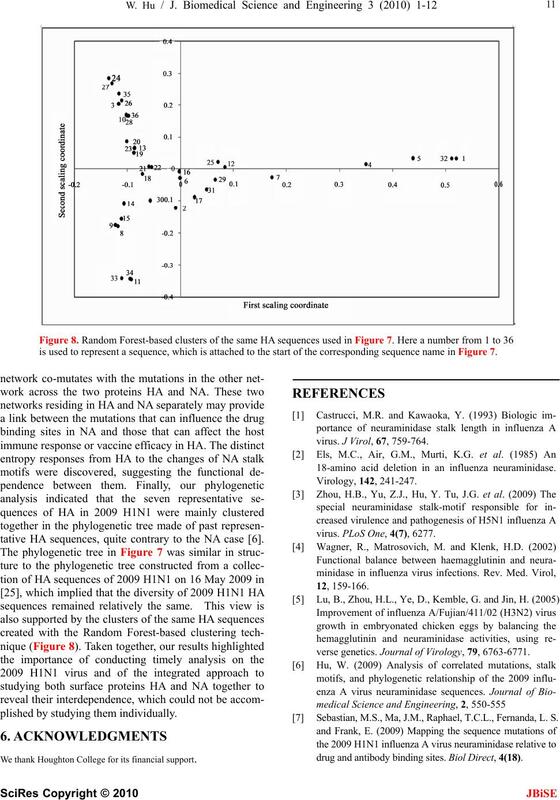 2009 H1N1 HA mutations on the five epitopes. scaling coordinates were utilized to visualize the data. – 395, 431 – 435, 448 – 468.
eiptope regions of HA in H1N1 as discovered in . thesis indicate the entropy of the amino acids of HA at that position. 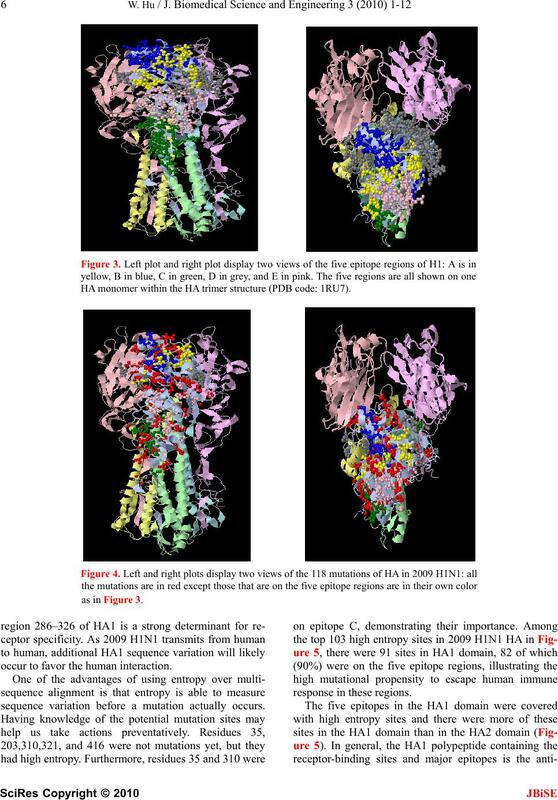 2009 H1N1 HA to this 3D model (Figure 4). was in agreement with the previous findings in . HA monomer within the HA trimer structure (PDB code: 1RU7). occur to favor the human interaction. sequence variation before a mutation actually occurs. residue if it was on one of the five epitope regions. the whole structure in the virus membrane. zero. Four networks of co-mutations were identified. network co-mutated with all the others in the network. co-mutation pairs in Table 4 were in the HA1 domain. to a new host, reassortment, or therapeutic intervention. by specific mutations in HA. length of 548 and the NA sequences had a length of 469.
was appended to a residue if it was on one of the five epitope regions. Table 5. Top 53 pairs of co-mutations in between HA and NA of 2009 H1N1. All have a P value of zero. need to maintain a functional balance. residues in the other network. only using the information from NA along to study NA. constructed from a collection of HA sequences in . design and administration of this type of new drugs. HA1 was the focus of vaccine design in the past. Figure 7. Phylogenetic tree of the HA protein sequences of the H1 subtype family. essential for the development of new drugs and vaccine. 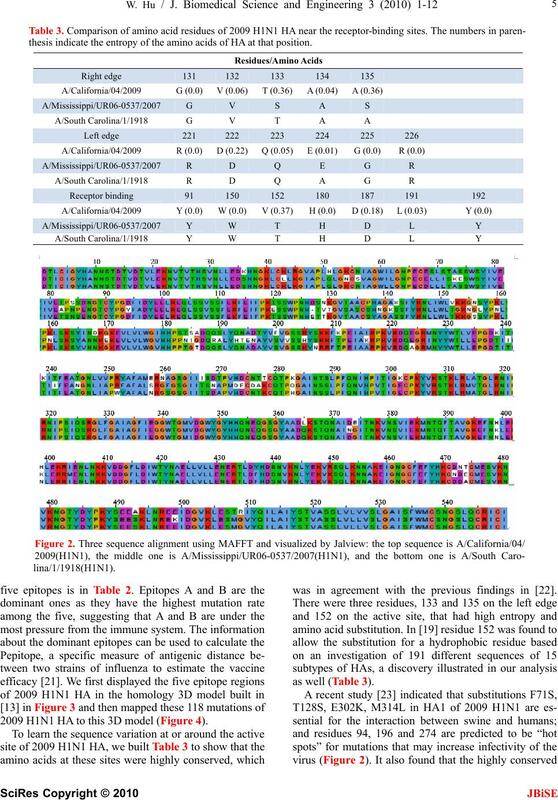 is used to represent a sequence, which is attached to the start of the corresponding sequence name in Figure 7.
tative HA sequences, quite contrary to the NA case . plished by studying them individually. virus. J Virol, 67, 759-764. 18-amino acid deletion in an influenza neuraminidase. virus. PLoS One, 4(7), 6277.
verse genetics. 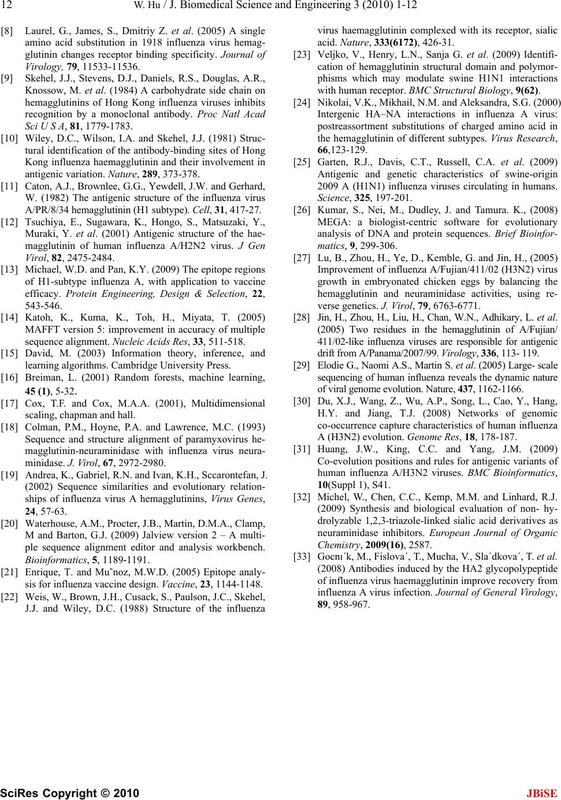 Journal of Virology, 79, 6763-6771. Sebastian, M.S., Ma, J.M., Raphael, T.C.L., Fernanda, L. S.
drug and antibody binding sites. Biol Direct, 4(18). Sci U S A, 81, 1779-1783.
antigenic variation. Nature, 289, 373-378. A/PR/8/34 hemagglutinin (H1 subtype). Cell, 31, 417-27.
minidase. J. Virol, 67, 2972-2980. Andrea, K., Gabriel, R.N. and Ivan, K.H., Sccarontefan, J.
ple sequence alignment editor and analysis workbench. sis for influenza vaccine design. Vaccine, 23, 1144‐1148. with human receptor. BMC Structural Biology, 9(62). 2009 A (H1N1) influenza viruses circulating in humans. verse genetics. J. Virol, 79, 6763-6771. 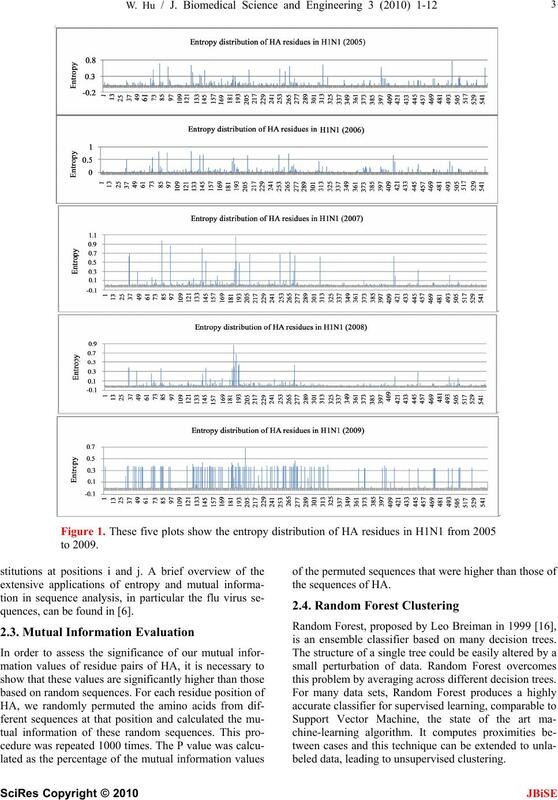 Jin, H., Zhou, H., Liu, H., Chan, W.N., Adhikary, L. et al. drift from A/Panama/2007/99. 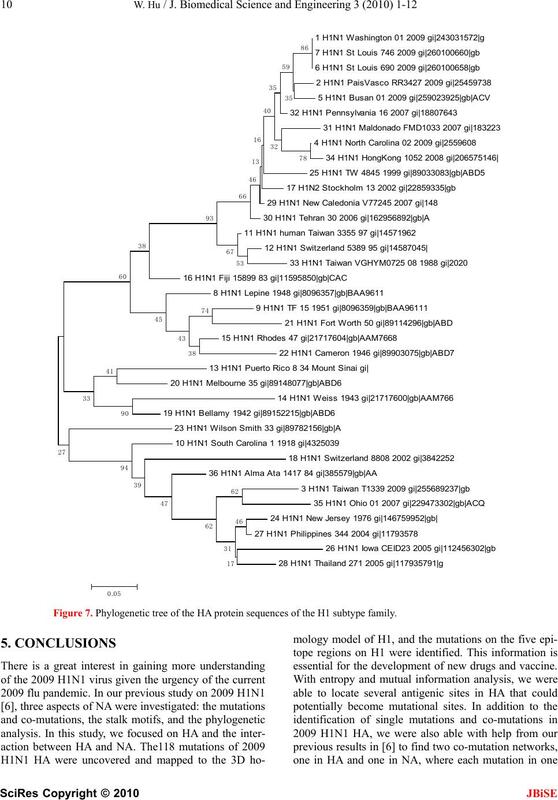 Virology, 336, 113- 119.
of viral genome evolution. Nature, 437, 1162-1166. A (H3N2) evolution. Genome Res, 18, 178-187. Michel, W., Chen, C.C., Kemp, M.M. and Linhard, R.J.
 Gocnı´k, M., Fislova´, T., Mucha, V., Sla´dkova´, T. et al.